Allow me to introduce myself. My name is Mari and I was invited by Wendy to begin writing some vegetarian posts for Eat Local, West Michigan. A truly exciting prospect! This year I was thrilled to celebrate my 20th vegetarian anniversary in a little party with some close friends (we ate Thai food). I’m excited to ring in this most notable of anniversary years by getting back to blogging by sharing some of my restaurant adventures, recipes, and other food experiences with you. I love to travel the area and seek out the best local and ethnic veggie options I can find. My nose is to the ground! High praise considering that we were currently chowing down on some deeply flavored fried vegetable patties called pakoras. These change daily to be made out of onions and whatever vegetable is available, ours were cauliflower and covered in a seasoned salt, we dipped them in twin sauces, sour and refreshing one made of tamarind the other of mint. I’m not sure how long Pal’s Indian Cuisine has been open as it first came to my attention about six months ago. It is worthy of much note that Pal’s recently made a gutsy choice and moved from a space that was far too big for their needs and that didn’t suit their appropriate ambiance and are now a few doors down in a much smaller but more appropriate space. In the Grand Rapids scheme of things I don’t think Pal’s gets as much credit as they deserve for the quality of their food. Possibly because of their location: hidden on 28th st by Woodland Mall. It can be very easy to drive by at a high speed and never notice this hidden strip-mall treasure. 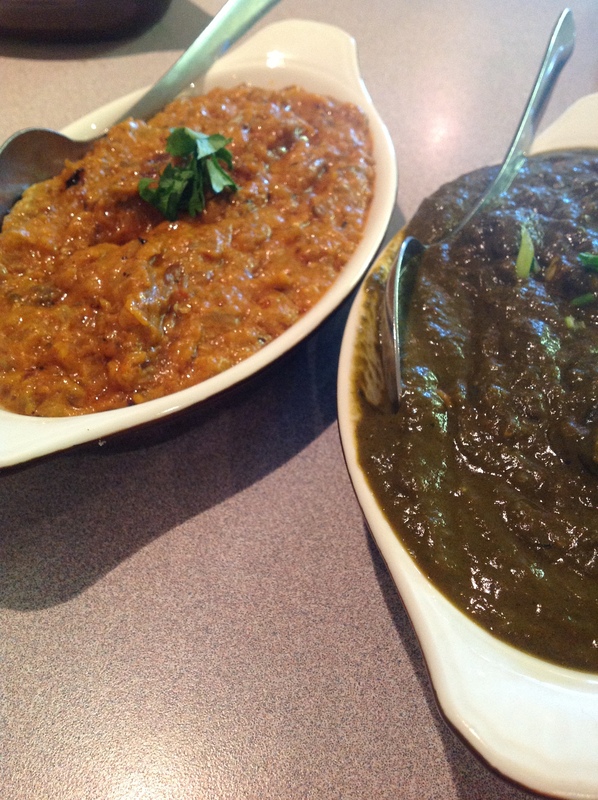 As our meal continued we were moving on to our main courses; a grilled eggplant and tomato dish called baingan bartha and a pureed spinach dish with fresh Indian cheese known as palak paneer, both classics of Northern Indian cusine. We mixed the soft seasoned vegetables with basmati rice and scooped them up with savory garlic naan bread. The chef at Pal’s also mixed up a fresh batch of their house hot sauce for me (they’d run out of this popular condiment) so that my dining companion and I could share a low level of spiciness in our food but I could satisfy my inner chili-head. Our waiter told us that the naan was cooked in a special clay oven called a tandoor. Dough is stretched out and slapped against the hot oven sides giving the bread a smoky charred flavor. When it’s done it simply falls off the walls into the center where it’s retrieved. It can be left plain or flavorings such as our garlic can be added after the baking proccess. I think we both felt like we were dragging ourselves away from our plates when dessert came, so involved were we with the vegetables. But there they sat: three golden orbs of gulab jamun, fried cheese balls soaking in sugar syrup. The rest of the meal was so great I was sad to have the jamun fall a little flat but the syrup really needed to be infused with something; orange rind, cardamom, rose water, anything. However the texture was good and as always this dessert is very charming. In all, Pal’s is excellent Indian food and I’m so glad it’s in the Grand Rapids area. The waitstaff are geeky and incredibly helpful. The new location is perfect, the ambiance just right for a small restaurant of this type. Cost runs about $11 an entree. In terms of a vegetarian restaurant there are around 10 veg choices to choose from, more than half are vegan. There are 3 veg appetizers, all are vegan. If you go to this restaurant and are vegan be sure to tell the waitstaff and they will help you pick out appropriate choices from the menu and point out when other dishes can be veganized.